In honor of XXXTentacion's 21st birthday, Lil Wayne pays tribute to the late rapper in the video for their Carter V collaboration "Don't Cry." 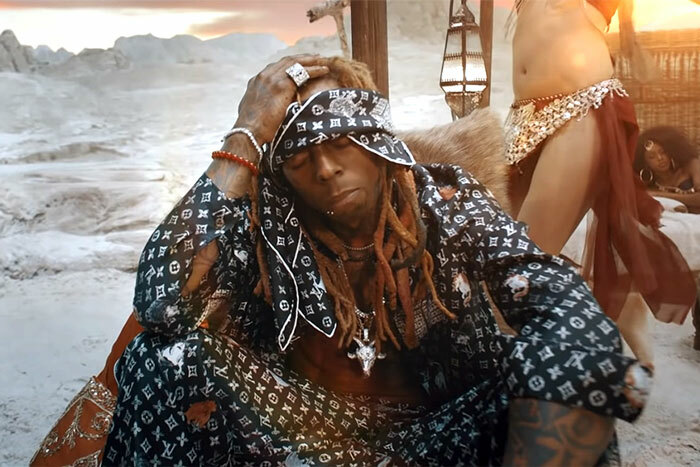 The post-apocalyptic clip finds Weezy in the snow-covered Moroccan desert surrounded by belly-dancing women and camels. Decked out in Louis Vuitton pajamas, a carefree Weezy reclines on a cowhide rug while smoking a blunt. Tunechi later takes a seat on a throne alongside a nun, whose eyes start to bleed black. The visual ends with a black-and-white montage of photos and a dedication to the late MC: "R.I.P. XXXTentacion 01/23/98 - 06/18/18."